Buy here. Can't find UK version, mine was ordered from US. Never having tested out any of Kat Von D's cosmetics and after reading/seeing all the good reviews about her line, I was definitely eager to try some things out. 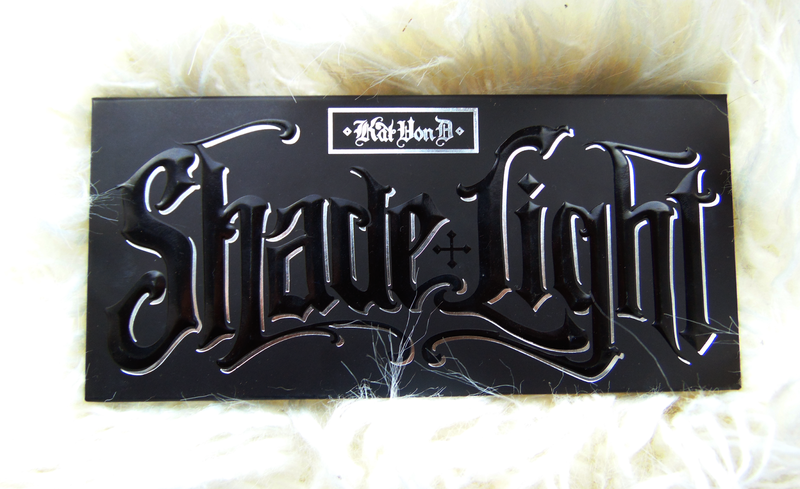 Kat Von D released a 6 pan contour palette ($46 - about £32) at the beginning of this year with the highlight shade and contour shade conveniently grouped together so that the palette is easy to use for beginners. Lucid: This is the first highlight shade in the palette and is probably the most neutral. It has some soft pink undertones but nothing too dramatic, this shade will probably suit the majority of people. It can also be used for a setting powder on paler skinned people. 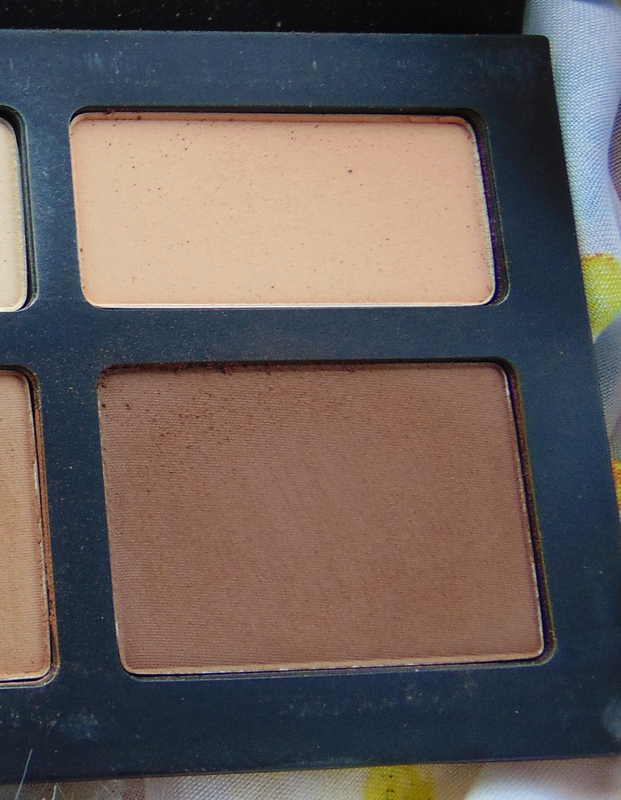 Sombre: An ashy brown contour shade, probably my favourite shade in the palette (don't you think all contour shades are extremely orangey?). The ashy tones in this pan really do mimic the shade of a real shadow - which is what everyone wants in a contour. I've really packed this on and it has never turned out muddy. 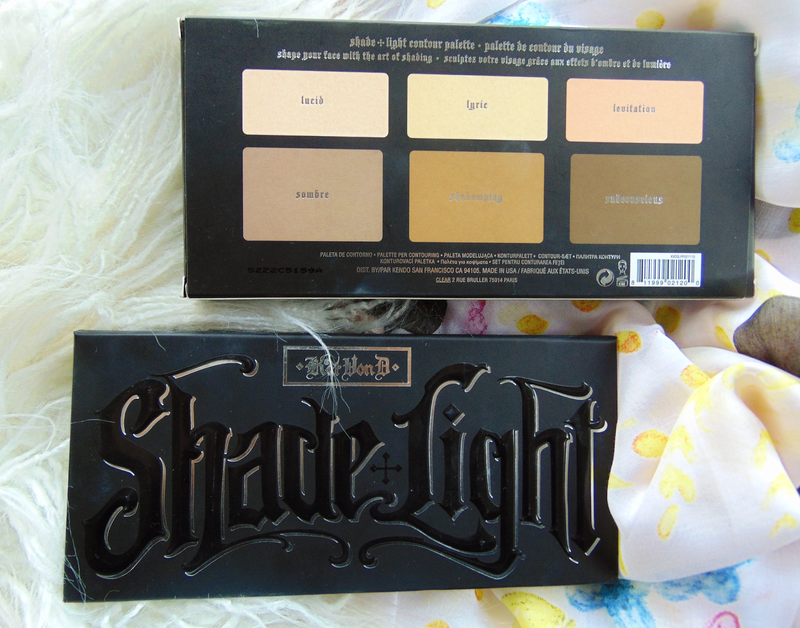 Overall, brilliant contour shade for most skin tones (I fake tan and therefore quite dark and it works really well packed on but without tan and at my palest it also works with a light hand). Lyric: A banana yellow shade, perfect for a strong under-eye highlight. My skin has strong yellow undertones (even without false tan) and it can be really difficult to find powders that work as a highlight but this does the job. It doesn't look ashy and is an almost dupe for Ben Nye's banana powder. My only wish was that it was slightly more pigmented, but that's just because I love a really, really dramatic contour. Shadowplay: Slightly warmer than Sombre. I thought I would absolutely love this shade, using this for a few days when I first got the palette but I'm actually not that impressed. It's just a regular contour shade and as I have a Nars contour palette with Laguna and Casino in it, I've been reaching for that more. Levitation: An orange-peach toned setting powder, perfect for anyone with deep-toned skin. I haven't yet used this shade as I think it's slightly too dark for me, but if you have darker skin this would be perfect. Subconscious: The darkest shade in the palette. Still relatively ashy-toned but does have some slight warmth in the pan. Would work well for a very dramatic contour on medium-skinned ladies or would even work on dark-skin. I actually do use this as it blends out like a dream and doesn't look muddy at all, despite the dark tone. 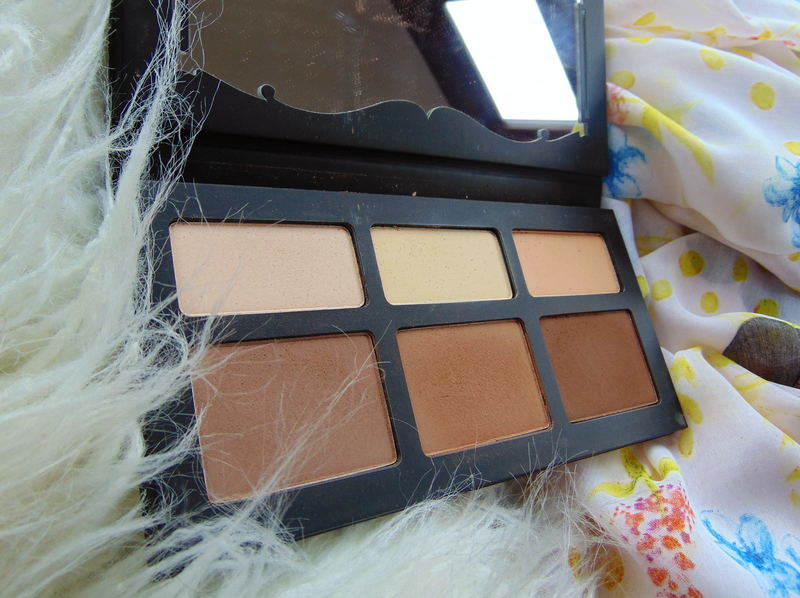 I do like this palette, and as I received this as a gift it's perfect but there are a few cons. One of the biggest being that the powder particles do seem to fly everywhere the second you put your brush in the pan meaning the packaging can become quite dirty - I've only had my palette for a week and there is powder all over it, I dread to think what it will look like in a year. Despite that, the palette is very nice to look at with a huge mirror inside. Overall, I do think it's worth the money if you can pick it up in store but as it's not yet available in the UK and only in Sephora stores (I know my parents had to pay a tonne in shipping to get this to me) I don't think I would buy it again if I ever used it up or lost it. The only real light shade I like in this palette is Lyric and even then I will often just use the white-ish shade from the Ambient Lighting Edit palette instead. I do like the contour shades but as I previously mentioned I like my Nars bronzers equally as much. 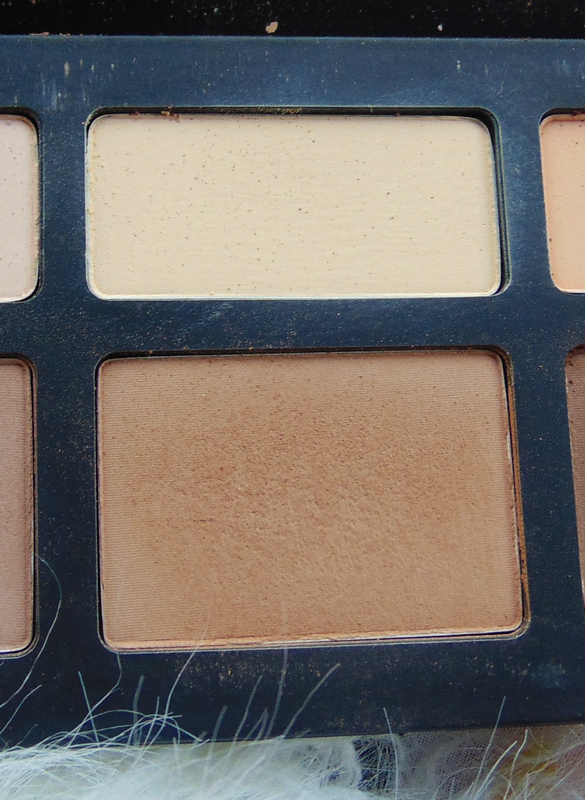 I think if you don't have many other contour shades then this is a definite winner, but if, like me, you already have other products that work well, I think you should save your money and give this a miss. Have you ever tried Kat Von D cosmetics? 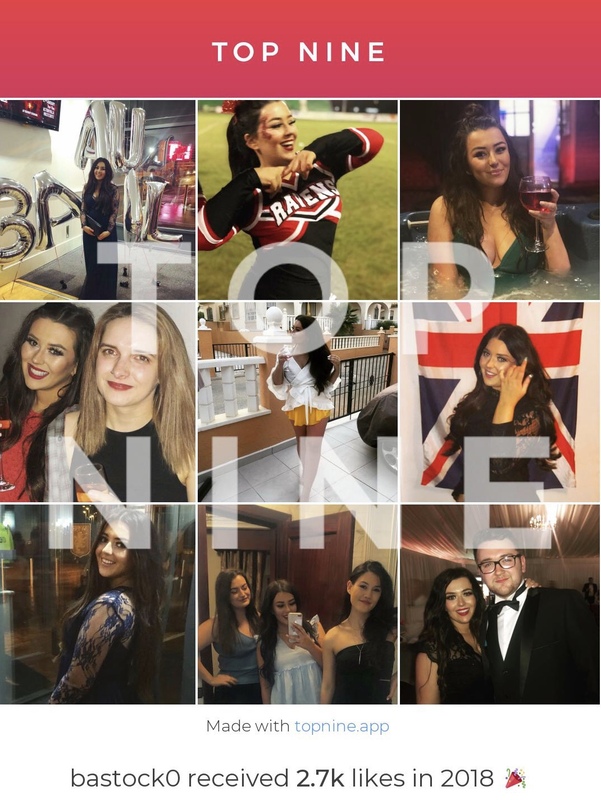 What's your favourite product? Yeah, I agree with you there. They're useful for someone like me who fake tans and skin is always a different colour too haha :) I just also love everything to be in a palette form, I don't know why, it just seems easier for me. Wow, I haven't used this palette but heard great things about it. I didn't know it was that powdery; that's a turn off. 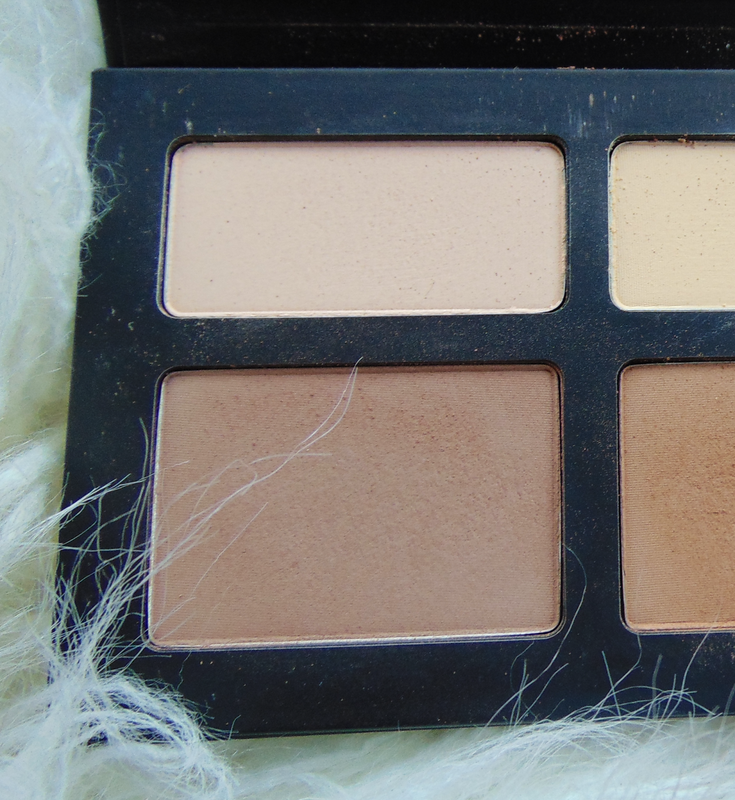 I've worked with Anastasia Beverly Hills Contour Kit and I love working with that one- even on the eyes! I've used Kat Von D products in the past- (used to work at Sephora) I do like the brand overall; I'm still interested in trying it out one day! Thanks for your honest review! Yeah nor did I, I don't know if I've gotten a dud or if it's due to being posted from America but as soon as I put my brush in the pan powder flies everywhere. I nearly chose the Anastasia one instead but this had just such good reviews, don't get me wrong, it's still a good palette but I just didn't necessarily NEED it in my life. I'll check that post out, thanks! Might be worth a shot. I've never tried anything else, I really should do before I write the brand off completely. nice review. Looks like a great product. It's too bad you don't like it enough to repurchase but you should definitely go with the products that work best for you. Such a great review - I have such a pet peeve about powder fall out into the packaging so I'll have to have a think about this palette! I would love to try these! I do hate powder mess, but they look super pretty! Hello, i bought this same palette on ebay and mine has the little cross in the middle, just like yours. But in sephora.com this palette doesnt have a cross in the middle. Could it be that ours is fake or imitation?